If any of you were wondering if I fell off of the face of the planet, well, I didn't, but I did get a lot done nonetheless. First off, I spent a lot of time editing the pics I took for Verona Grove and also getting to know my spinning wheel. 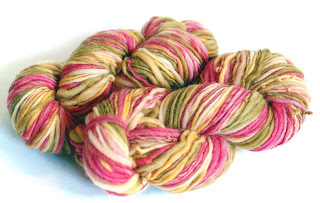 This yarn is self striping, as is the one below it. 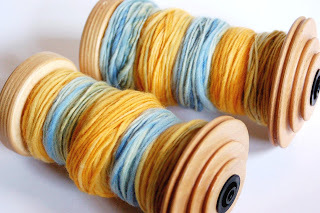 I loved doing these heavy worsted weight skeins, and by the time I started doing the blue and yellow ones it was going very smoothly. 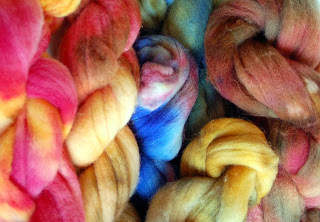 I also dyed some roving yesterday because I ran out of dyed rovings from my previous session. 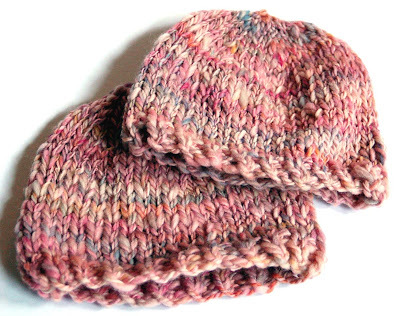 These two hats were made from the first giant skein of yarn that I spun on the new wheel, and I think they turned out fairly nicely considering the fact that it was my first attempt at spinning on my new wheel. Last but not least, these are the rest of the yarns that I did this week. 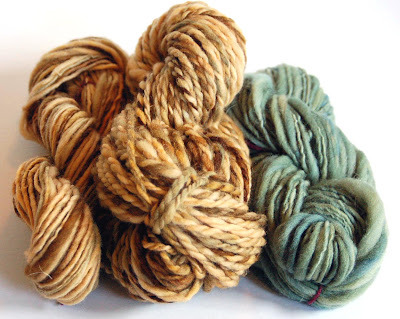 The green ones are both from the same roving, and the blue one is my first attempt at spinning a slubby yarn. Phwew! Can you tell I am addicted? gosh. All of your yarn pics are beautiful! I just bought myself my first drop-spindle. I'm using the "beginner's" fiber choice: pre-cut wool, for drafting. I hope it turns out well. I still have to dye it first, before I try it out.